Home / Stock Picks / Hot Stocks / Should You Short Tesla Inc Stock Following Bizarre Earnings Call? Should You Short Tesla Inc Stock Following Bizarre Earnings Call? Despite a tough year for TSLA, you should buy Tesla stock once all the negativity is priced in. Virtually all companies talk about innovation. Only a few, like Tesla Inc (NASDAQ:TSLA), back up their claims with substantive results. But lately, TSLA hasn’t looked like the cocksure organization for which they’re renowned. With shares dropping more than 5.5% on Thursday, investors openly wonder: should I buy Tesla stock? Or is going short Tesla the safest action? Throughout my time covering TSLA, I’ve generally maintained a positive outlook. Thus, I’m not one to short Tesla. Sure, the stock has a reputation for being wild, even compared to other technology firms. Plus, CEO Elon Musk doesn’t do things the conventional way. The man launched his Tesla Roadster into space. And not just any roadster but his personal ride. But the company’s (and the founder’s) quirks are what endeared me to TSLA stock. In the ultra-competitive automobile market, you need whatever distinctions you can get. At least, that was what proved successful in the past. But recently, many investors consider TSLA’s “my way or the highway” attitude a liability. Thus, the cries to short Tesla. In a first-quarter 2018 earnings report, which saw the company extending its earnings per share losses, the biggest story wasn’t the company’s consensus beat. Instead, it was what Cowen analyst Jeffrey Osborne dubbed a “surreal” environment. Morgan Stanley’s Adam Jonas backed up this assessment, stating that it was the strangest earnings call in his 20-year tenure. Controversially, “Musk refused to answer questions from analysts on Tesla’s capital requirements, saying ‘boring questions are not cool.’” If you wanted to short Tesla based on this comment alone, I wouldn’t blame you. I hate excuse-making, especially when it comes from the top. Still, investors will want to consider both sides of the argument. Should I Buy Tesla Stock as a Contrarian Play? Immediately from a tactical perspective, I’m hesitant on the negative play. Because the general opinion toward the company’s conference call was universal, so too is the “short Tesla” argument. You usually don’t make much money betting on the same horse that everybody favors. First up, let’s talk about one of the most numbers: vehicle deliveries. In the most recent quarter, TSLA delivered just under 30,000 cars. This is up 20% against the year-ago quarter when the company delivered 20,000 cars. Of course, bearish analysts point out that management plunked, and continues to plunk, significant resources to push these deliveries. These costs are rising, and Tesla doesn’t seem to have convincing answers. Still, our own James Brumley points out that the Q1 haul is more electric vehicles than Ford Motor Company (NYSE:F), General Motors Company (NYSE:GM) and Toyota Motor Corp (ADR) (NYSE:TM) sold, combined. And yes, TSLA has significant trouble meeting its lofty 5,000 unit target for Model 3 sales. But Brumley counters that 450,000 drivers are on a waiting list for the Model 3. I mean, come on! Who waits for a standard-production car in this market? Clearly, demand remains ultra-strong for the company’s product offerings, which makes the idea to short Tesla highly risky. Finally, TSLA’s concerted efforts have delivered phenomenal macro results. 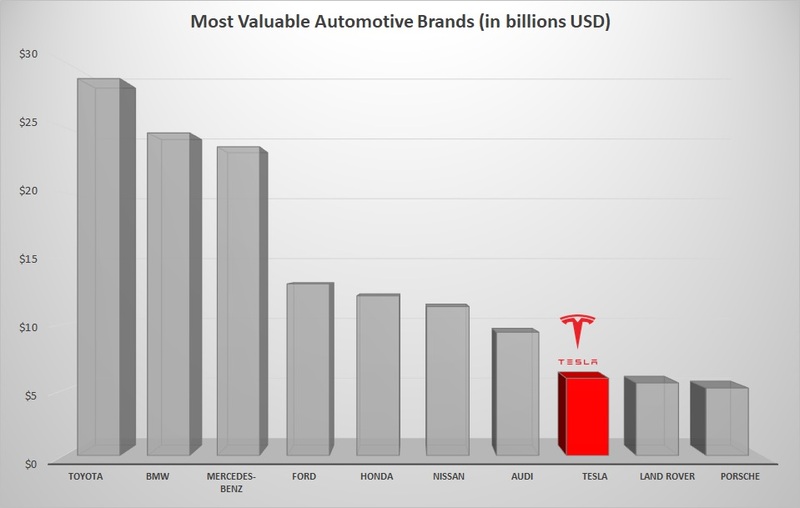 As an automotive brand, Tesla ranks number eight among the most valuable in the world at nearly $5.9 billion. To put this into perspective, TSLA outranks Land Rover ($5.53 billion) and Porsche ($5.14 billion). Keep in mind that the latter two are premium automakers, and are right in line with Tesla’s target demographic. Since no one quarter usually makes or breaks a company, to short Tesla appears an overreaction. Instead, these facts suggest you should buy Tesla stock. With all that said, I go back to Wall Street’s number-one rule: the markets can stay irrational longer than you can stay solvent. In other words, the markets always have the final word. I concede the technical chart for TSLA stock is hind-end ugly. On a year-to-date basis, shares are down 9%. Currently, the equity trades below both its 50- and 200-day moving averages. And the big one for me is that Tesla is charting a series of lower highs and lower lows. Since shares failed horizontal support at the psychologically important $300 level, the next logical direction is down. Certainly, Musk did his long-term shareholders no favors during the conference call. Bad things happen when you play games with Wall Street’s playmakers. But only engage the short trade if you have the time to do so. What I mean is, if you have a job that prevents you from regular access to your portfolio, stay away. The ugliness in TSLA stock is probably temporary. I’m not a fan of what Musk did. Yeah, he’s cool and trendy, but he’s got to know when to keep his mouth shut. But this is a company that is single-handedly rejuvenating a stale, old industry. Short Tesla stock? Maybe, but get ready to load up when the negative sentiment fades. 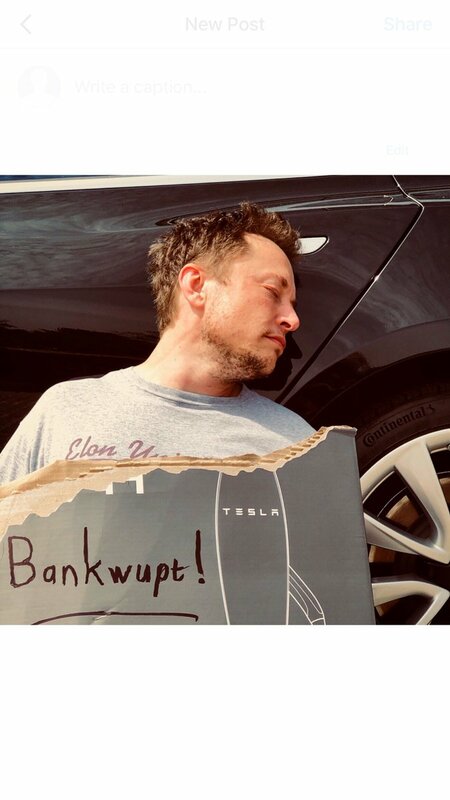 Article printed from InvestorPlace Media, https://investorplace.com/2018/05/should-you-short-tesla-inc-stock-following-bizarre-earnings-call/.